This lap desk can make working on the couch a lot easier. 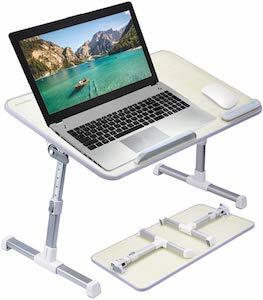 Now you can just sit in a chair and use you lap desk to hold your laptop or paperwork. It even has a little pocket on the side that can hold pens, wires and so on. And because you use it a lot this lap desk can be detached from the pillow so that you can wash the pillow if needed. If you want a lap desk then go look at the Homz Storage Lap Desk.